We, supported by the Regency Society and Hove Civic Society, were able to commission a blue plaque, now on an outside wall of Connaught School, dedicated to the architect Thomas Simpson (1825-1908) who designed several board schools in Brighton & Hove..
2010-11 The Council decided the Connaught School in Hove should be returned to its original use as a primary and junior school. This, together with getting it listed, was a major success for us. With members of the Conservation Area Advisory Group we achieved an improved frontage to the planned new Royal Sussex County Hospital, having accepted that it was impossible to retain the Barry building. We supported the Montpelier & Clifton Hill Association in its campaign to retain the main building of the Royal Alexandra Children’s Hospital and for an acceptable design for the new development on the site. This resulted in the main building being retained and converted. We commented on the draft planning brief for the Preston Road barracks site in the hope of retaining at least one of the Crimea War or Mannock buildings. We had been concerned about vandalism on The Level for many years. The Heritage Lottery Fund and Parks for People awarded £2m for its restoration and we were one of the stakeholder groups selected to provide feedback on the plans, which have proved very successful. BRIGHTON & HOVE LOCAL PLAN: We commented on four areas in this crucial council planning policy document: housing delivery, student housing, Park & Ride and transport options, and employment. Overall, with the exception of transport, we considered the draft option papers had been well thought through. We continued to press for improvements to the design of the new Hospital, but were removed from the bi-monthly consultation meetings because our representative did not live within half a mile of the site. We submitted comments on the National Planning Policy Framework to the Department of Communities and Local Government. Of our 19 suggestions for change, 7 were accepted and 5 resulted in partial amendments. We made numerous suggestions for buildings to be included on the Council’s Local List – the old Grade III listing – for buildings considered of interest and value in the townscape, and which should be considered when developments and alterations are proposed. Schools and pubs were the main candidates! 2012-2013: ANSTON HOUSE: The application for two tower blocks to replace long derelict Anston House was withdrawn at the last minute following a letter from us questioning the accuracy of the developer’s shadow plots for the overshadowing of Preston Park. These had been significantly under-estimated. The design of the vertical block of 15 storeys and the choice of materials were both unacceptable, particularly as they were sited so near the houses in Dyke Road Drive. 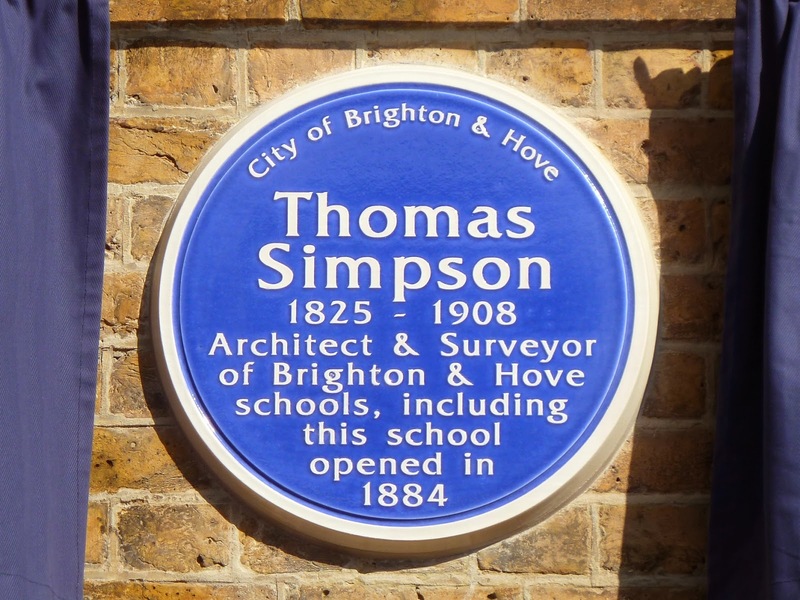 We, supported by the Regency Society and Hove Civic Society, were able to commission a blue plaque, now on an outside wall of Connaught School, dedicated to the architect Thomas Simpson (1825-1908) who designed several board schools in Brighton & Hove. We joined other conservation societies in campaigning to retain the interesting frontage of the old Co-op department store on London Road, and were successful. 2013-14: We objected strongly to the plans for the proposed redevelopment of Circus Street on the grounds of gross over-development with tall black buildings surrounding sunless courtyards. Sadly, permission was granted. Not everyone supported our decision not to object to the demolition of the Timpson’s building in North Street to provide a twitten into a proposed new Hannington’s Lane area behind. It has however allowed the pre-Regency Puget’s Cottage, previously concealed and constructed from an interesting mix of materials, to be retained and exposed. We hope it will lead to an interesting and worthwhile redevelopment of a neglected area. 2014-15: A development brief was issued by the Shoreham Harbour Port Authority together with Adur and Brighton & Hove councils, on which we commented extensively. We have highlighted many opportunities for major improvements in the harbour area which in our opinion had been overlooked. We commented on the Council’s suggested urban fringe potential sites for new housing, in response to strong government pressure, some of which were in our view unsuitable. We participated in the Conservation Advisory Group’s Forum, offering to help the Planning Department which is currently suffering severely from cuts. 2015-16: We are concerned about the proliferation of ugly graffiti in North Laine and the town centre. Both tagging by vandals and commissioned “art” murals are taking over large areas. Committee members visited Chichester where graffiti is no longer a problem, and hope to persuade the Council to take similar steps in Brighton and Hove. We continued to raise serious concerns about the plans for the redevelopment of Valley Gardens, which we feel may seriously affect the vulnerable old buildings on either side. We campaigned for the retention of Hove Library, and were thanked for our involvement when the scheme to move it was refused. We strongly criticised the plans for the redevelopment of the Sackville Hotel site. These have subsequently been much improved. We joined other concerned groups in questioning the Council’s reaction to the supposed dangerous condition of Madeira Terrace. A committee member is currently reviewing the many structural reports that have been prepared over several years. We commented in detail on the Council’s Sea Front Strategy, covering the seafront from Shoreham Harbour to Rottingdean. Members of the committee played an active part in preparing a new appraisal of the Old Town Conservation Area, and are now members of the steering committee.